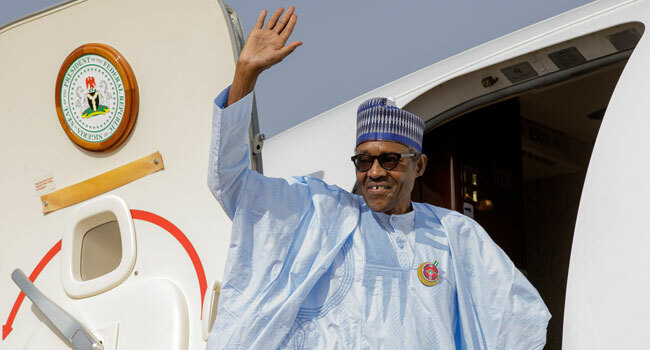 President Muhammadu Buhari has arrived in Zamfara, in continuation of his visit to states affected by herdsmen crisis. He arrived at the Katsina Airport on Thursday morning where he was warmly received by the state Governor Aminu Bello and members of the executive council, after which he left for Zamfara. He was accompanied by the National Security Adviser Babagana Mungunu and other top officials. The President commenced his visit to affected states on March 5, with Taraba state where he called for an end to the bloodshed. Subsequently, he visited Benue and Yobe states while he is still expected to visit Rivers state. The visit follows the wanton killings, as well as other security issues that have occurred in various states since the beginning of the year. During his visit in Yobe state, he met with parents of the abducted Dapchi schoolgirls, traditional rulers, and community leaders, among other stakeholders and promised them of his admintration’s efforts in securing their release. Also in Benue state, which has recorded the highest number of deaths since the herdsmen crisis began, he sympathised with families who have lost their loved ones. Consequently, President Buhari promised Nigerians and victims of the attacks that justice will be served. He, however, noted that a collective effort is required to maintain peace and security.